This is the final post in a SGT series that looks at CSA -- community supported agriculture -- from the farmer's perspective. 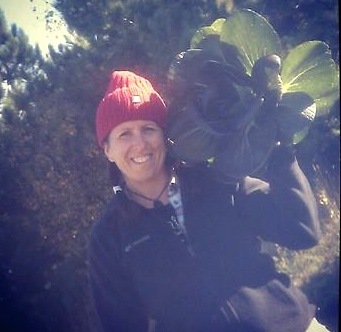 Also check out earlier posts: Meet Your Farmer, Adventures in Farming, Managing Expectations, Crop Planning, Add-On Partnerships, Farmer-to-Member Communications, Preventing Waste, and Greenhouse Days. As farmers markets begin and photos of radishes, spring lettuce mixes, and herbs start popping up on farm Facebook pages, the question that most CSA members have is simple: when is the delivery start date? The answer is far less straightforward, but boils down to a three-word reply: we don't know. Not yet, anyway. It would be heavenly to have a predictable farm schedule, and give members a rock-solid start date to a CSA, but that kind of certainty is usually impossible unless a farmer has intensive operations using hoophouses. Hoophouses -- which look like greenhouses but often aren't heated -- protect young plants from extreme weather and keep the ground warmer, allowing for a different schedule than plants in the field. Still, even with hoophouses, many starts need some time in a traditional field environment, where the wind, rain, and sun can bolster them to full growth. Since Bossy Acres is only in its second season and we rent land, we haven't been able to construct any hoophouses (fingers crossed for next year! ), which leaves us at the mercy of the elements. 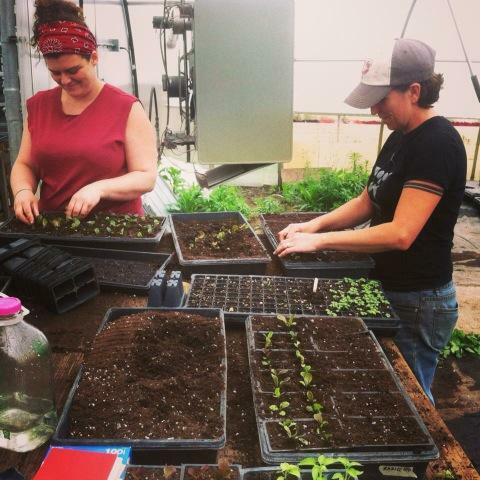 Our farm schedule is closely tied to fieldwork, including tilling the soil, preparing beds, and planting the first batch of greenhouse-grown plant starts. You may have noticed that it seems to be raining quite a bit in Minnesota lately, and most likely, your thoughts were along the lines of "Oh well, guess I'll grill another night." Our thoughts are very different, and definitely bittersweet. Given last year's crushing drought, the rain is welcome for reducing potential drought conditions this year. When it rains this much, it's nearly impossible to get a tractor into the fields to till properly. Not only do you risk getting stuck in mud, but the damp soil compacts more easily. Soil compaction and farming are not a happy couple — roots aren't able to extend as far as they should, and root vegetables like carrots, radishes, and potatoes get stunted with compaction. Picture trying to grow carrots in a parking lot with a couple inches of topsoil on top of it. With the rain over the last couple weeks, we started our transplanting, but certainly spend more time than we'd like puttering around, making minor repairs to equipment, running to Mills Fleet Farm for raingear, and doing some greenhouse seeding for fall crops (yes, we have to plan that far ahead). We'd much rather be out in the fields getting all the transplants in and seeding more vegetables. Although the rain nourishes transplants already in the fields, we certainly need some "dry out" time for those as well. 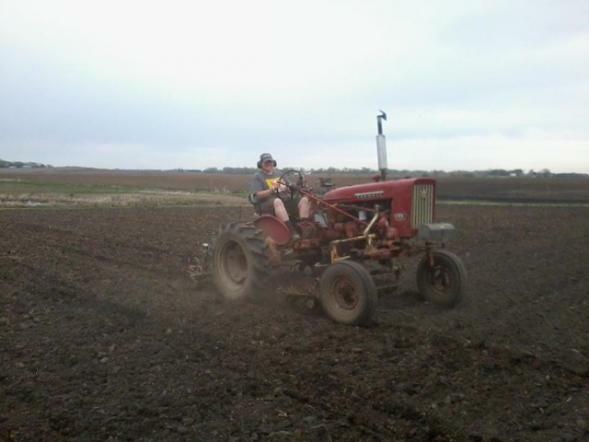 The stress is compounded by the fact that we couldn't get into the fields until the second week of May, since we're farming in Northfield and a snowstorm socked that area (along with much of southeastern Minnesota) those first few days of May. That left us waiting to get into the fields and, when we could finally till, we scrambled to make up for lost time but now the rain continues. Quick tip: This isn't a great time to strike up a conversation with a farmer about the weather. Part of the later planting schedule this year involves cooler ground temperatures, which delay putting in plants like tomatoes, eggplants, and peppers, which thrive on warmth. Some farms decided to take a chance and plant them anyway, and we don't blame them — so much of farming involves risk, to the degree that would make even a hardened gambler flinch. You have an open window of time when it's not raining, and your tomatoes are beginning to suffer from being in the greenhouse for too long, so you plant them and cross your fingers. We haven't put those crops in yet, waiting for ground temperatures to increase, but most likely we'll be doing our own farming roulette soon. To maximize our chances at success, for those crops we'll lay down plastic mulch, which comes in a huge roll and provides a durable cover for a strip of soil. The covering increases the soil temperature, and for planting, you simply poke holes in the plastic and put the transplants in, where they stay cozy at the root level while still getting the sun and rain on the top. The largest factor for determining a CSA start date, though, is consistency in terms of production. We could start our CSA right now and hand each member a single bag of greenhouse-grown microgreens and baby lettuces. But next week, we'd have either one more small bag, or possibly nothing. Starting the CSA based on the calendar and not on the fields would lead to dissatisfaction for everyone. Before we set a date, we need to know that the members will receive a good portion of vegetables on the first delivery day, and also on every subsequent one after that. Although produce amounts are on a curve (see Adventures in Farming's section "CSA 101" for thoughts on the amount of vegetables delivered during an early season versus August or September), that doesn't mean we want weeks of low production with the hope that vegetables will start popping eventually. We'd rather delay the start date so we can kick off strong, and probably extend longer into the fall, than begin too early and risk member disappointment. In general, we probably won't know our start date for at least another week, as we assess the fields and watch the skies. Like many farms, we're hoping for mid-to-late June, but as always, it's only partially up to us. 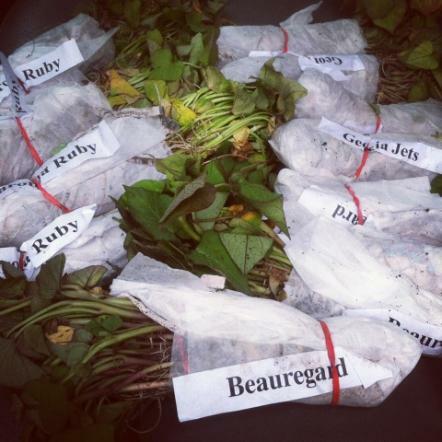 This is my last installment of Behind the CSA Box, so thanks to everyone who followed along on our pre-season adventures. 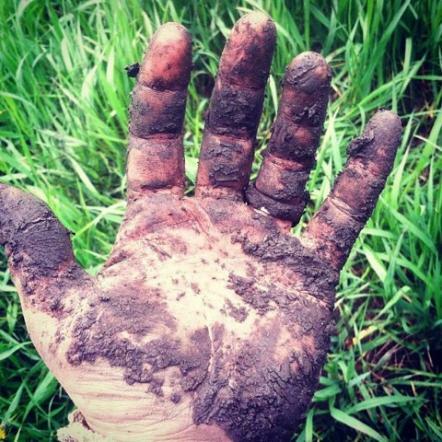 Hope the summer delivers amazing vegetables, muddy hands, and full bellies for all. Enjoy the sunny days and stay bossy! Elizabeth Millard owns Bossy Acres with her partner, Karla Pankow. They grow an array of delicious vegetables in Northfield, using sustainable and organic methods. Their CSA is sold out, but they'll be at the Mill City Farmers Market in May, and offering vegetables through Twin Cities Local Food during the season. Follow them on Facebook and on Twitter at @BossyAcres.